Straddling Lake Titicaca, Puno is a great place to explore from but also a fantastic city in its own right. The area has a rich history with impressive architecture still standing as testament. There are a number of churches in the city from the colonial period, initially built by the Spanish in an attempt to evangelize the natives. And of course, it sits beside the beautiful lake that is itself full of wonders. We’ve selected the best places to stay in Puno to make the most of its history and natural beauty. Lake Titicaca - Unsurprisingly, the lake is top of the list. Firstly, its enormous, you’ll be forgiven for thinking that Puno sits on the seaside. Up in the Andes mountains, it’s also one of the highest lakes in the world. Take a boat trip to see the beautiful traditional fishing boats and visit the stunning islands to see some pre-Inca ruins! Taquile Island - An island in the lake, Tarquile has a host of friendly inhabitants, beautiful scenery and snow-capped mountains for a backdrop. Uros Floating Islands - Although very commercialised these days, the man-made floating islands are still a spectacle to behold. Either stay the night on one of the straw rooms or just drop by for a visit. As a heads up, the inhabitants will expect a tip after you listen to their singing. Sillustani - Drop in on the lake island to witness huge pre-Incan burial chambers! Visit the dramatic Catedral de Puno which provides great views of the plaza. The interior is especially spectacular with wonderful artwork and visitors are able to light a candle and enjoy a peaceful moment. Our selection of the best places to stay in Puno allow visitors to enjoy luxurious surroundings and experience the best of the local cuisine. 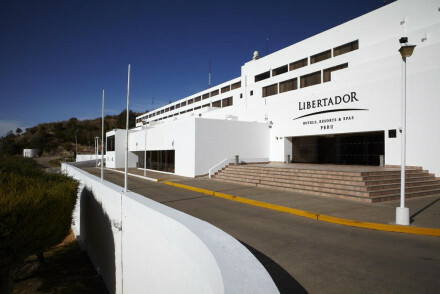 Stay on your own island at Libertador. Attached to the mainland by road, the hotel offers luxurious accommodation, fantastic views over the water and a restaurant showcasing the best of Peruvian cuisine. If you'd prefer your own space, don't hesitate to visit our online partner Booking.com for a range of properties ideal for exploring the town. Fly to Inca Manco Cápac International Airport situated 52km (32 miles) from Puno with domestic flight connections to Lima and Cusco. Alternatively, catch the train with connections to Cusco. Or the bus, serving notable locations including Cusco and Arequipa. Best time to visit - being a particularly high city, the temperature can fluctuate a fair amount. The area never gets overly warm so don’t forget to bring a jumper. To avoid the rain, aim to visit between May and August. A luxury hotel boasting an epic location on its own island sitting in Lake Titicaca. Contemporary rooms are simply dressed with crisp white linen, soft hues and large windows framing the stunning views. Sample Peruvian classics in the restaurant and unwind in the pampering spa. Superb. Local markets - Soak in the atmosphere of the weekend market in Puno. 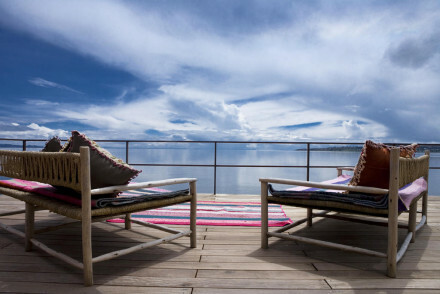 Hideaway - Unwind on this private island set in Lake Titicaca. Sailing - Take a romantic boat ride on the vast lake. Great walks - Take a stroll around the island. A stunning, full-service hotel in an incredible setting looking over Lake Titicaca. The superb contemporary design harness natural light and allows for superb views out over the water. With an edge of the world feeling, it's a fantastic place for couple looking for intimacy and relaxation. Romantic Break - Luxurious rooms and a heavenly lakeside setting make it perfect for a romantic hideaway. Back to Nature - Immerse yourself in beautiful isolation on the shore of Titicaca Lake. Birdwatching - Titicaca Lake is home to vast array of Peruvian bird species. Great walks - Beautiful walking routes along the edge of Titicaca Lake.